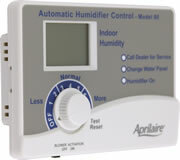 The new Aprilaire model 60 automatic humidistat w/Outdooor Sensor. Replaces the model 56 and 58. It includes humidistat, outdoor temperature sensor, installation instructions and owners manual. Measuring 5 15/16" W X 4 1/4"" H; this humidistat mounts on return duct work. For use with Aprilaire Humidifier model 400, 500, 600 and 700 Series. The Model 60 digital humidistat can turn on your HVAC blower when there's no need for humidification or heat. The control will accurately control the humidity in your home based on outdoor tempreature to maintain the maximum confort. It works in conjuction with your heating, ventilating, ait cinditioning equipment (HVAC) to control the operation of the humidifier. The indoor humidity level needs to be set based on the outside temperature. This is to prevent water from running down the windows. The cool air near the windows can not hold the humidity and water will condense on the glass. To prevent this condensation, the indoor humidity level is sacrificed by lowering the humidistat. An automatic humidistat (Aprilaire 60) adjusts the humidity by using an outside temperature sensor. 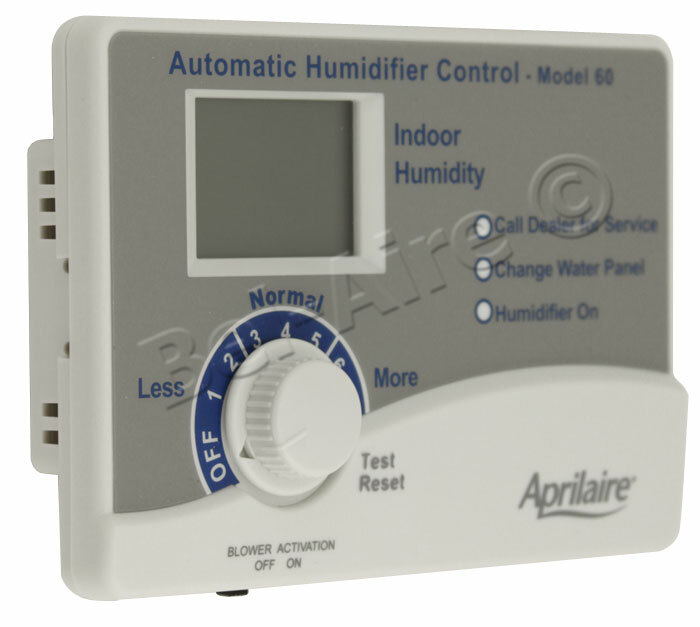 The Aprilaire manual humidistat as used in earlier Aprilaire humidifiers (Model 4655) requires adjusting the relative humidity based on the outside temperature. A manual humidistat needs to be set back as the season gets colder. The chart below shows the humidity setting for a range of outside temperatures.